Hhohho (in the north), Manzini (west-central), Lubombo (east) and Shiselweni (south). Climate: The Highveld is near-temperate and humid, the Middleveld and Lubombo subtropical, the Lowveld near-tropical. Swaziland is one of the best-watered countries in southern Africa although, in common with the rear of the region, rainfall may be unreliable and periods of drought occur in the Lowveld, for example in 2004-05. Summer (October-March) is the rainy season. There is occasional, short-lived frost in the Highveld and the Middleveld. 1,231,000 (2012); 21 per cent of people live in urban areas. The population growth rate stood at 1.6 per cent p.a. between the years of 1990 and 2012. In 2012 the birth rate was 30 per 1,000 people (49 in 1970) and life expectancy was 49 years, having fallen sharply since the latter 1990s due to AIDS (61 in 1990 and 60 in 1997). Swazis make up 90 per cent of the population; people of other African, European or mixed descent make up ten per cent. Large numbers of Mozambicans fled to Swaziland to escape the civil war, but repatriation was completed in 1993. 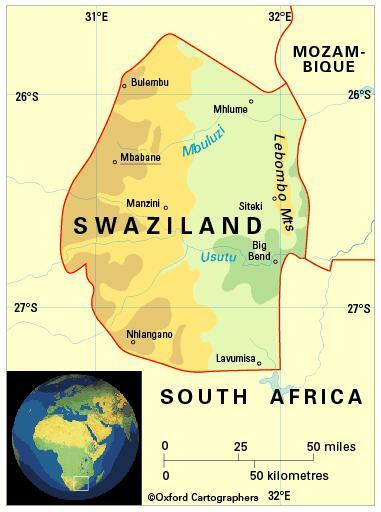 Swaziland is classified as a lower-middle-income economy by the World Bank.